Have you heard about the benefits Electro-acupuncture? There are many benefits to acupuncture, but why stop there? Electro-acupuncture takes your healing to the next level. 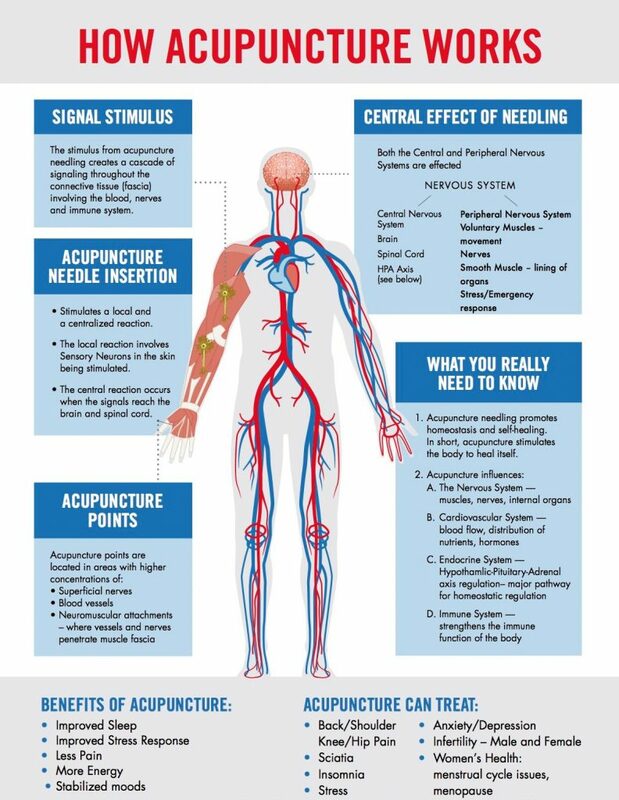 Acupuncture stimulates the connective tissue which affects blood circulation, nerves, and the immune system. The healing begins! In addition to that, an electro-stim device can be connected to primary acupuncture points to increase efficiency and homeostasis that will last beyond your appointment. If you’ve never experienced this before, it probably sounds intimidating, but in reality, it’s actually very relaxing. The electro-stim impulses that flow through your pain points are rhythmic and subtle. The soothing pulse from the micro or milli currents that pass through the electroacupuncture technology can be adjusted to the perfect intensity to treat each point properly and put you in a state of relaxation. It’s not uncommon for patients to fall asleep during the treatment. Electroacupuncture has been effective in relieving a wide range of conditions throughout the whole body. One of the reasons for its success is it stimulates blood flow, or “qi”, according to Chinese medicine. By increasing the flow of your blood, your body creates more endorphins and promotes self-healing. The electric current allows these endorphins to reach a larger area around each point than traditional acupuncture. Also, by activating your body’s self-healing process more deeply, the endorphins are able to repair your connective tissue by circulating in your bloodstream for an extended period of time. Like traditional acupuncture, electroacupuncture is effective in treating various areas of pain and health conditions. “Electro-acupuncture treatment for depression is as effective as a recommended dose of fluoxetine,” according to the US National Library of health. The way electroacupuncture stimulates your body’s own self-healing process enables it to benefit your body holistically. By activating the cardiovascular system, immune system, and endocrine system it regulates the functions of the body that may be out of balance, contributing or causing the discomfort that you’re seeking treatment for. These are just a few examples displaying the versatility of electroacupuncture. Whether you’ve been struggling with pain and discomfort or you’re looking to enhance your flexibility and athletic performance, you’re always welcome to schedule for a complimentary consultation with Alvaro, our acupuncture physician. He’s experienced great results utilizing this approach to treat his patients and he’s happy to get to know you and answer any questions you might have!